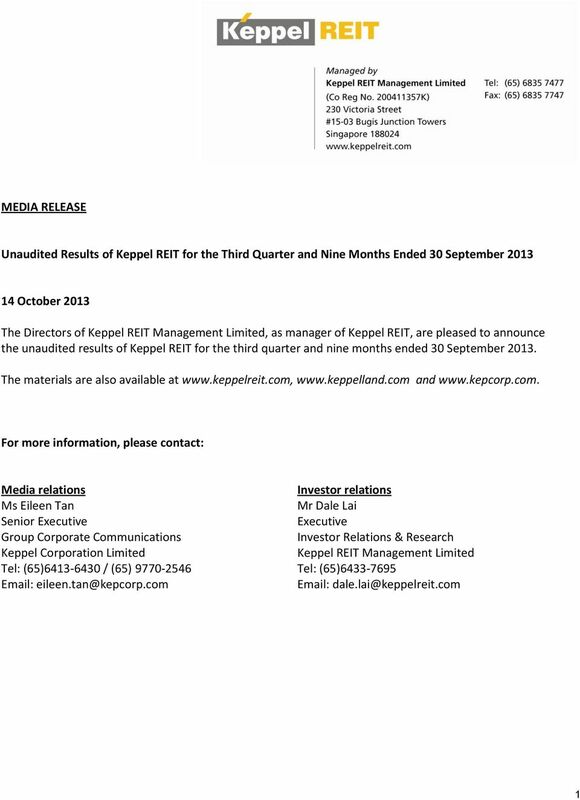 Download "Unaudited Results of Keppel REIT for the Third Quarter and Nine Months Ended 30 September 2013"
Spring REIT Launches Initial Public Offering Offer Price between HK$3.81 and HK$4.03 per Unit Raising up to approximately HK$1. 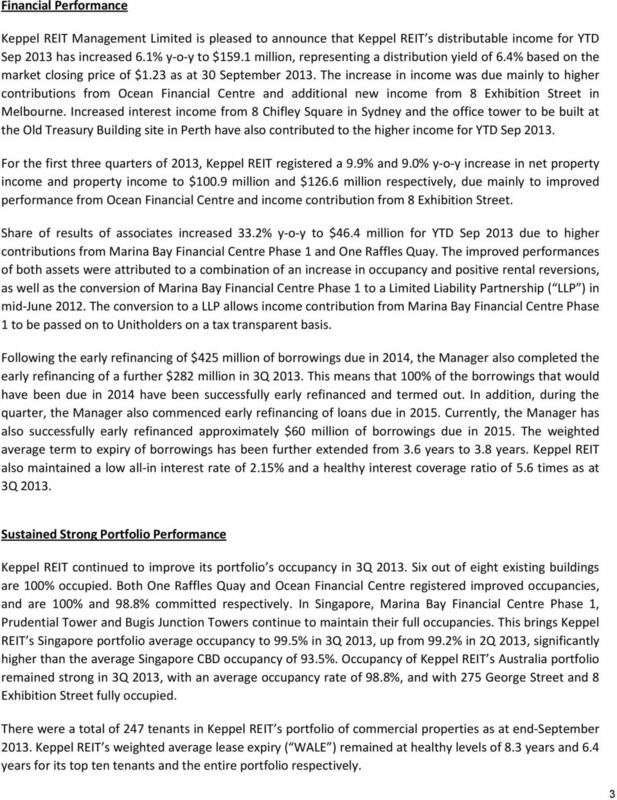 FIRST CAPITAL REALTY ANNOUNCES STRONG 2008 YEAR END RESULTS Strong portfolio fundamentals and substantial liquidity. 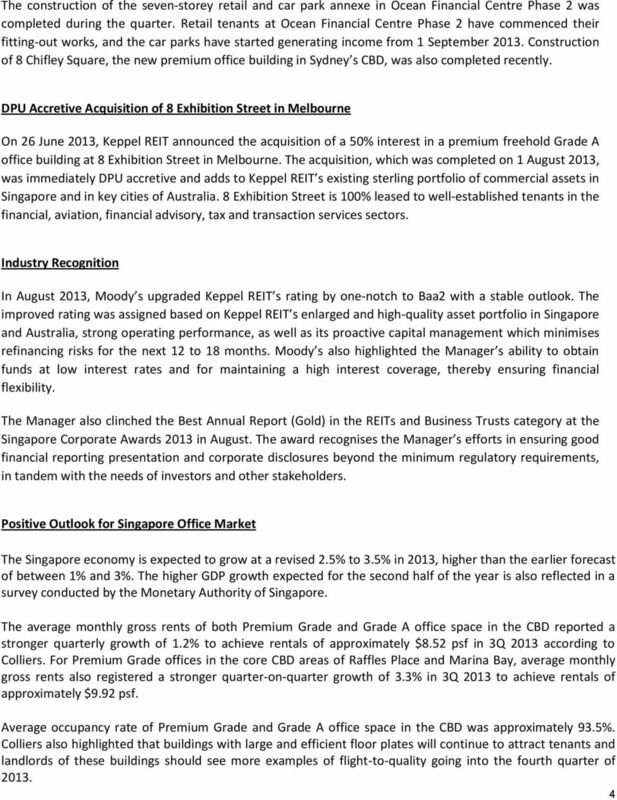 GGP REPORTS THIRD QUARTER 2014 RESULTS Same Store NOI Increases 5.4%; Company EBITDA Increases 6.7% Company FFO per Share Increases 13. News Release INVESTOR AND MEDIA CONTACT: George R. Kirkland Senior Vice President and Treasurer Phone: (229) 873-3830 gkirkland@sgfc. 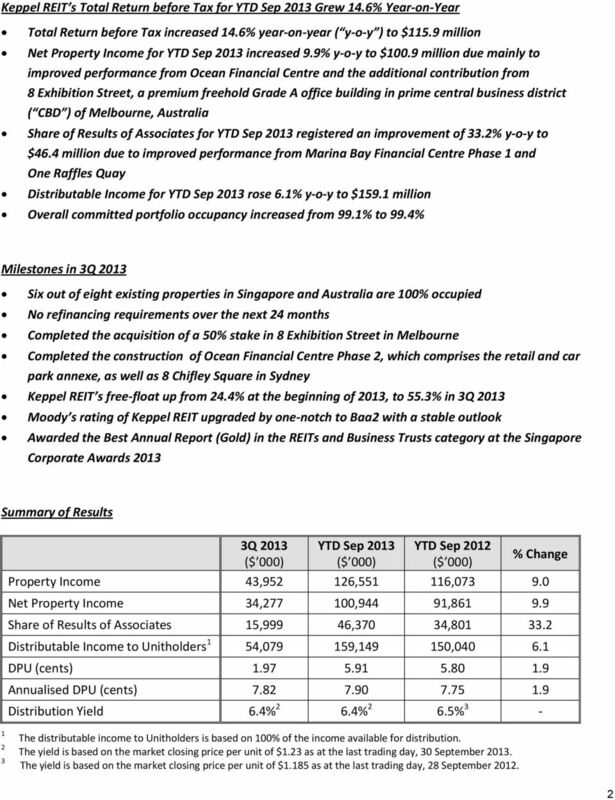 NEWS RELEASE BROOKFIELD OFFICE PROPERTIES REPORTS FIRST QUARTER 2014 RESULTS All dollar references are in U.S. dollars unless noted otherwise. NEW YORK, April 25, 2014 Brookfield Office Properties Inc.
Thursday July 18, 2013 FOR IMMEDIATE RELEASE Washington Federal Reports Higher Net Income, Announces the Acquisition of 51 Branches in Four States, and Completes Conversion to a National Bank Charter. 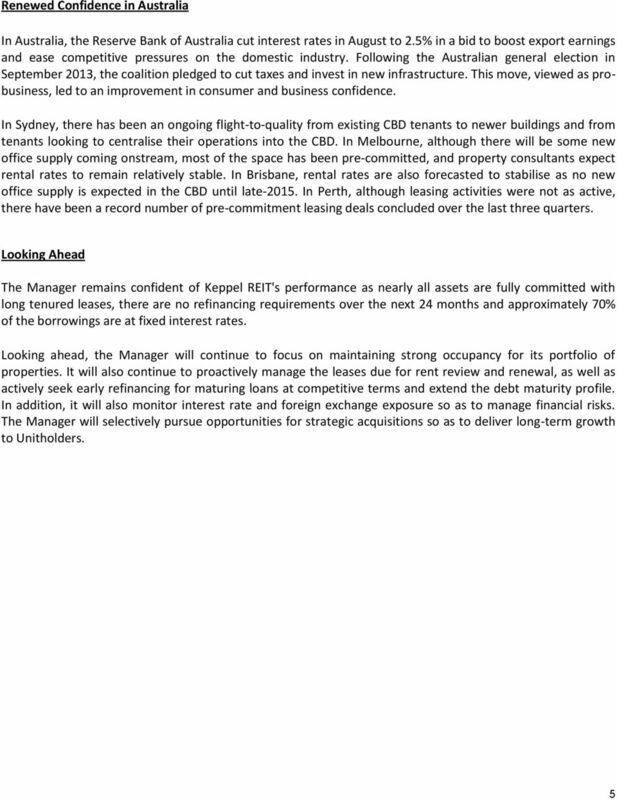 Standard Chartered today releases its Interim Management Statement for the third quarter of 2015. 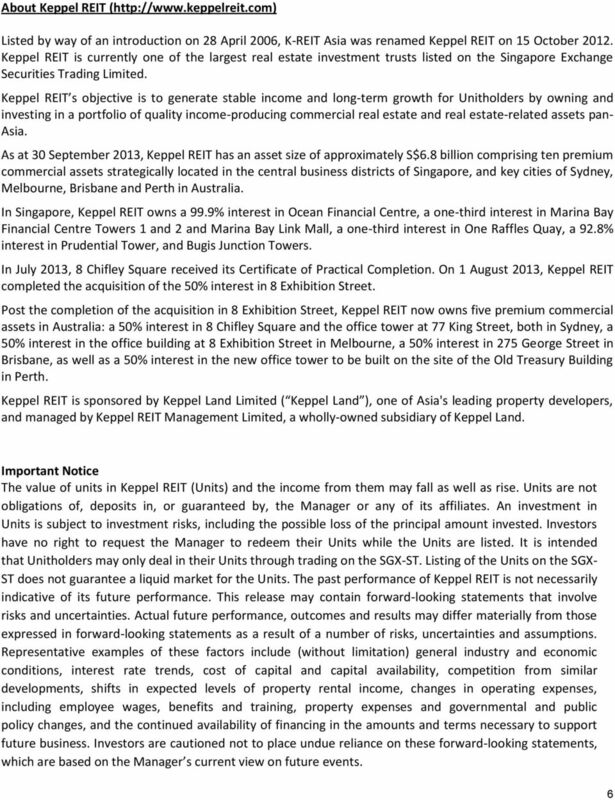 Investing in unlisted property schemes? TRANSITIONING PCCW David Prince, Group CFO CLSA Investors Forum Hong Kong - 15 May, 2001 FORWARD LOOKING STATEMENTS This presentation contains forward-looking statements that involve risks and uncertainties.